Passes a burn, poison, or paralysis to the foe. The Pokémon copies a foe’s Ability. Anticipates an ally’s attack and dodges it. X The cheerful spirit of its Trainer gives it energy for its psychokinetic power. It spins and dances when happy. X Die fröhliche Stimmung seines Trainers verleiht ihm Energie für psychokinetische Kraft. Wenn es glücklich ist, tanzt und dreht es sich. X Ce Pokémon tire ses pouvoirs psy du soutien de son Dresseur. Il danse et tourne sur lui-même quand il est content. X Al percibir la alegría de su Entrenador refuerza sus ataques psicoquinéticos. Cuando está contento, da vueltas y baila. X Lo spirito gioioso è alla base dei suoi poteri psicocinetici. Quando è felice si lancia in danze e piroette. X 트레이너의 밝은 마음이 사이코 파워의 근원이다. 즐거워지면 빙글빙글 춤춘다. Y It has a psychic power that enables it to distort the space around it and see into the future. Y Seine Psycho-Kräfte erlauben es ihm, den Raum um sich zu verformen und so in die Zukunft zu sehen. Y Il peut distordre l’espace-temps grâce à ses pouvoirs psy et ainsi voir l’avenir. Y Con sus poderes psíquicos puede deformar el espacio a su alrededor y predecir el futuro. Y Usa i suoi poteri psichici per dare all’aria circostante un aspetto distorto e prevedere l’avvenire. Y 사이코 파워를 조작해 주변의 공간을 비틀고 구부려 미래를 내다볼 수 있다. Omega Ruby Kirlia uses the horns on its head to amplify its psychokinetic power. When the Pokémon uses its power, the air around it becomes distorted, creating mirages of nonexistent scenery. 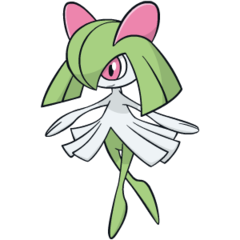 Omega Ruby Kirlia benutzt die Hörner an seinem Kopf dazu, seine psychokinetische Energie zu verstärken. Wenn dieses Pokémon seine spezielle Kraft einsetzt, wird die Luft verformt und ein Trugbild einer Landschaft erzeugt. Omega Ruby Kirlia utilise ses cornes pour amplifier ses pouvoirs télékinétiques. Lorsque ce Pokémon utilise son pouvoir, l’air ambiant se déforme et crée des mirages de paysages qui n’existent pas. Omega Ruby Kirlia usa los cuernos para amplificar los poderes de psicoquinesia que tiene. Cuando los usa, altera el ambiente, lo transforma y crea espejismos. Omega Ruby Kirlia usa le corna sul capo per amplificare i suoi poteri psicocinetici. Quando il Pokémon usa tali poteri, l’aria circostante assume un aspetto distorto, creando miraggi di scenari inesistenti. Omega Ruby 머리의 뿔로 증폭된 사이코 파워를 사용할 때 주변의 공간이 비틀어져 현실에는 없는 풍경이 보인다고 한다. 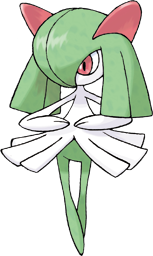 Alpha Sapphire It is said that a Kirlia that is exposed to the positive emotions of its Trainer grows beautiful. This Pokémon controls psychokinetic powers with its highly developed brain. Alpha Sapphire Man sagt, dass ein Kirlia, das häufig positive Emotionen seines Trainers wahrnimmt, sehr schön wird. Dieses Pokémon kontrolliert psychokinetische Energie mit seinem hochentwickelten Gehirn. Alpha Sapphire On dit qu’un Kirlia exposé aux émotions positives de son Dresseur devient très beau. Le cerveau surdéveloppé de ce Pokémon lui permet de contrôler les forces télékinétiques. Alpha Sapphire Dicen que, al recibir los sentimientos positivos de su Entrenador, Kirlia crece con gran belleza. Este Pokémon controla poderes psicoquinéticos gracias al desarrollado cerebro que tiene. Alpha Sapphire Si dice che Kirlia cresca molto bene se viene esposto alle emozioni positive del suo Allenatore. Questo Pokémon è dotato di poteri psicocinetici grazie al suo cervello altamente sviluppato. Alpha Sapphire 트레이너의 긍정적인 감정에 닿은 킬리아는 아름답게 성장한다고 한다. 발달한 뇌로 사이코 파워를 다룬다. Ruby It is said that a Kirlia that is exposed to the positive emotions of its Trainer grows beautiful. This Pokemon controls psychokinetic powers with its highly developed brain. Sapphire KIRLIA uses the horns on its head to amplify its psychokinetic power. When the POKeMON uses its power, the air around it becomes distorted, creating mirages of nonexistent scenery. FireRed The cheerful spirit of its TRAINER gives it energy for its psychokinetic power. It spins and dances when happy. LeafGreen The cheerful spirit of its TRAINER gives it energy for its psychokinetic power. It spins and dances when happy. Emerald A KIRLIA has the psychic power to create a rip in the dimensions and see into the future. It is said to dance with pleasure on sunny mornings. Diamond It is highly perceptive of its Trainer's feelings. It dances when it is feeling happy. Pearl It is highly perceptive of its Trainer's feelings. It dances when it is feeling happy. Platinum If its Trainer becomes happy, it overflows with energy, dancing joyously while spinning about. HeartGold It has a psychic power that enables it to distort the space around it and see into the future. SoulSilver It has a psychic power that enables it to distort the space around it and see into the future. Black If its Trainer becomes happy, it overflows with energy, dancing joyously while spinning about. White If its Trainer becomes happy, it overflows with energy, dancing joyously while spinning about. Black 2 If its Trainer becomes happy, it overflows with energy, dancing joyously while spinning about. White 2 If its Trainer becomes happy, it overflows with energy, dancing joyously while spinning about.